We all know how much time is wasted preparing your tracks before even starting the creation process. 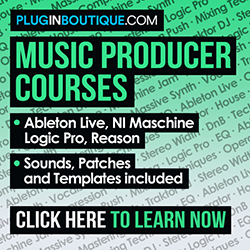 Putting your basic drum loop, creating a midi track, adding your plugins, equalizers, compressors and utilities. During all that time your idea is flying away! There are lots of different start up templates from different producers you can find online, but every producer has a different workflow. So copying someone else’s template won’t really help you… I’m going to show you what you need to prepare and how to save it so that the next time you launch Ableton you are ready to let loose your creativity! How many tracks do you use in a song? For most of my songs I use at least 2 audio tracks, 3 midi tracks and 2 reason tracks. Reason takes some time to set up, so the fact my start up template has Reason already rewired* saves me a lot of time! *For those of you who don’t know Reason or how to use it in Ableton, I will be writing an article shortly on how to set it up. On every track (midi, audio and the Reason audio track) I load up an Equalizer, a Compressor and a Utility. I always need them when it comes down to mixing and arranging time. Load up all of the “audio effects” you are sure to use. For your midi tracks make sure to add all the “midi effects” you will use. I like to add an Arpeggiator followed by a Chord. That is my personal style, I love to play around with those midi effects so I like them ready to go. *If you are going to use massive or any of your favorite plugins you can add them to. Our goal is to minimize the amount of work so you can just be creative. – I set my inputs on my audio tracks to “no inputs” to avoid recording by mistake or other problems. – I set up an extra audio track that I rename “Recording” with the input of my sound card. Now I only have one track capable of recording audio and then I just need to drag and drop my recordings on to my regular audio tracks. – I also set up an extra audio track that I call “resampling” with the audio input set to “resampling”. I use this track when I want to record one of my midi tracks and chop it up. – I also take time to set my “Ghost Sidechain” track (for my Compressors or Gates, which I also prepare) and my “Receive” with the appropriate effects. Drums are a very important part of producing and everyone has a different way of making drums. – If you like to use loops, then set up one or two extra audio tracks that you will name “Drums” (organization is KEY to improving your workflow! More details later on). – If you prefer to use a Drum Rack, then set up an extra midi track with the Drum Rack you always use. 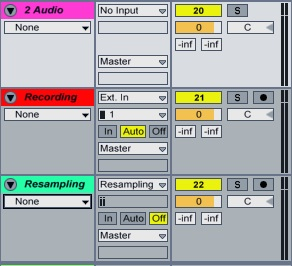 – I put a Simpler on each of the midi tracks as well with all the appropriate audio effects. And with the Group Track I put my Beat Repeater and other effects that I always wind up using. 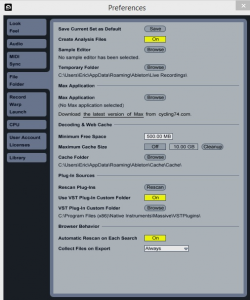 – Now I can set up my “Ghost Sidechain” track input. I either put the whole Drum Group or just the Kick track. *Make sure to turn all of your effects off! So you just have to turn them on when you need them. As I mentioned before, organization is the key in saving time. So that in one glimpse of the eye you can see what track is what. Ableton allows you to add colors to your tracks so do it! For example, put red on your “Recording” track, You will see how that track pops out from the rest. Organize it however you want it. You are building your own template to increase YOUR workflow. Customize it until you LOVE it, until you are PROUD and you will see how your creativity will increase. Take the time to put colors, renaming, making Macros for your multiple effects (we will see that in another article), setting your effects… The more work you do know the less you will have to do for ALL of your future songs! Save it first as a regular set and name it “My start up template” (or however you want it!). Saving it as a set will allow you to create several versions and keep track of any modification you will make. Once you start using your Start Up Template you might see some mistakes and want to modify them. For example, I noticed that my midi tracks where to low, I’m more comfortable having them near the drums. Or my Beat Repeater was on and every time I started a new song I needed to turn it off. Make sure to test your template and modify it as much as you need to make it a perfect fit with your producing style. Saving each as a Set allows you to keep track and … stay organized! To set your template as a default it is very easy. Go to “Options” = “Preferences”. This tutorial was made on Ableton Live 8, but it is exactly the same steps if you are on “Ableton Live 9”. If you have any questions or would like more details on a topic please feel free to comment below. Hope you enjoyed, Eric Dubois Prod.